As an iPhone gamer, a very cute and fun platformer game you may want to consider downloading is Little Acorns. This iPhone app was created by Chillingo Ltd. and sells for 99 cents in the iTunes App Store which is well worth its price. I downloaded the Little Acorns app to my iPhone 4 and have played it several times prior to this review. In a nutshell — no pun intended — if you are a fan of old school video games, you will love Little Acorns. 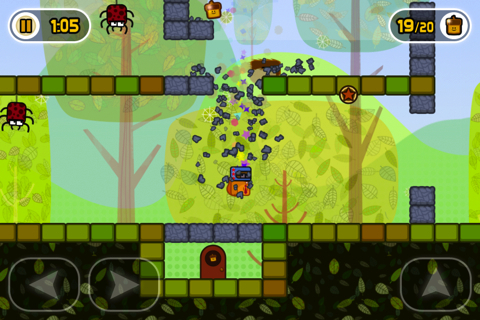 Little Acorns is very reminiscent of Nintendo’s Super Mario World with an iPhone vibe. The premise of the game; a cute little squirrel named Mr. Nibbles is on a mission to gather up a certain number of acorns in each level. 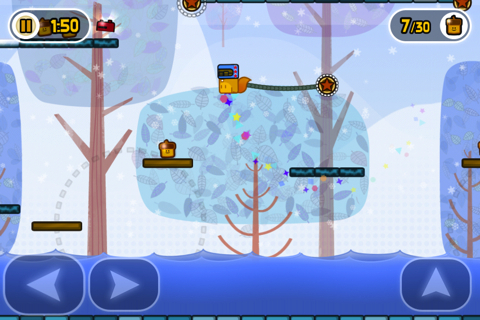 You are required to jump, swing and avoid obstacles in the way. Some of the obstacles in question include a green inchworm, huge bees and red spiders. They are in the way to try to hinder your progress toward collecting your acorns. There are also many different levels you have to jump to in order to acquire the acorns. Once you have gathered up the right number, you can also collect fruit for additional points. Little Acorns is divided up into different seasons, as well. During the spring, you have a mission in addition to collecting acorns, and that is to save your babies. The farther you go in the levels, you have opportunities to collect power ups, such as extra time, the ability to fly and the ability to perform jumps that are much higher than your regular ones. The overall concept of Little Acorns is great, and very reminiscent of old school Nintendo or Sega type games, as previously mentioned. Controls are simple and may remind users of handheld small game systems, except of course, the buttons are located on the touchscreen. You have directional buttons on the left bottom portion of your device’s screen, with the jump button on the bottom right. The graphics and audio of Little Acorns is absolutely adorable and totally fit in with the whole concept. The music is merry, the graphics brilliantly colorful, and your hero, Mr. Nibbles, even yells “Ouch!” when he bumps into an insect obstacle, which is funny and reminds you of the red bird from Angry Birds. Overall, Little Acorns is a lot of fun and should appeal to users of all ages. The application plays on both the iPad as well as the iPhone or iPod touch thanks to its universal nature. Both children and adults should love it and find it a great way to pass the time. It is challenging, but not overly so, and you may find yourself having to repeat a level on occasion. AppSafari review of Little Acorns was written by Darius Reimm on March 5th, 2012 and categorized under Adventure, App Store, Games, iPad apps, Platformer, Universal. Page viewed 3946 times, 1 so far today. Need help on using these apps? Please read the Help Page.